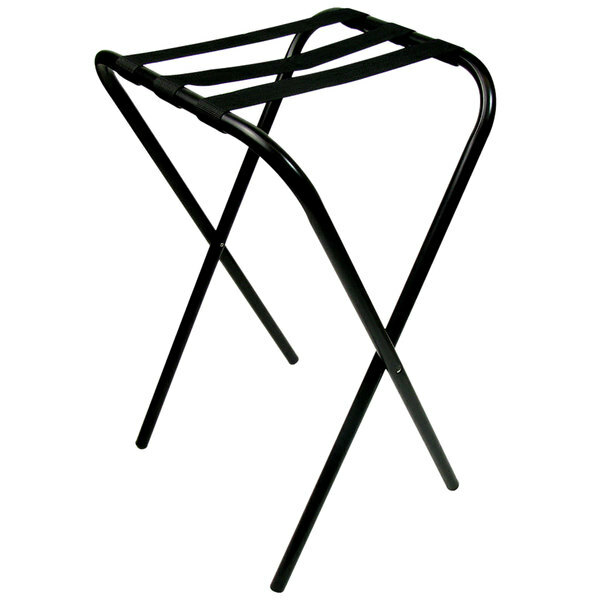 This economical Lancaster Table & Seating 31" tray stand features a black powder coated metal finish, and would be a great addition to your dining room service. Its space-saving folding design flips open easily to provide stable support for large trays of food. The convenient 31" height allows for easier tableside service. Non-marking rubber feet protect your floors while also providing added stability and slip resistance, even on wet surfaces. When opened, this tray stand's surface extends to 17" (strap length) x 19" (bar length), though it can hold larger trays as well.